Batman v Superman is the equivalent of banging pots and pans together while 100 strobe lights are going off. I have never wanted a movie to shut up more than I have here. I think that Zack Snyder has bought into his own hype and delivered a movie that is damn near incoherent. Superman is in trouble for killing a whole bunch of people in Africa, but they were shot and we never see Superman use a gun. Meanwhile, Bruce Wayne hates Superman because a guy who worked for Wayne lost his legs in the finale of Man of Steel. 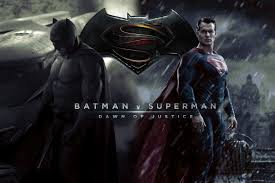 Batman and Superman do fight but the fight is done so poorly that I had a really hard time keeping up. I honestly don't think that Snyder directed this movie. I think that Michael Bay did. It feels like a Michael Bay movie anyway. Snyder also shoehorns so many things into the movie that I am sure that some people will miss them. The movie's run time of 2 1/2 hours is very draining on even the most forgiving moviegoer. The movie also has more fake out endings than the last Lord of the Rings movie. Plot points start and are left dangling with no resolution. Lex Luthor's ideas are just plain dumb. I didn't hate BvS. I just thought it was a lot for nothing. It had some good scenes here and there, but the movie has so much going on that another two hours wouldn't have solved it's problems. Oh and why did Batman and Superman have to fight? Because Lex wanted them too. Really. That is the reason that they throw down towards the end of the movie. Lex is played as a spoiled brat who always gets his way. Such a dumb reason for the supposed "fight of the year".